Ladies have both a body and a mind. At times the indiscrete, sweating, aging, and sagging former seems to hold the latter hostage. And yet, on a nice sunny day when one is feeling good, one hardly feels challenged by her embodiment and a lady might find herself seeking the affections of a gentleman. Indeed, the practice of hooking up at parties or at the prompt of a text message is now universal. A lady must therefore know how to proceed when under the sweet liberty of the primal pleasures of the body, especially because not all gentlemen will comport themselves with the propriety a well-mannered deportment demands. Indeed, some gentlemen will make impertinent carnal requests—nay, demands—insisting that they are subject to an infirmity of the sort that prevents them from having a rational command over their bodies. A lady need not bear this malady on his behalf. For this man, regardless of fame or fortune or position on the football team, is a blockhead and you may simply explain that you will not engage in this behavior and expect him to stop. Indeed, a lady ought to shout “STOP” as loudly as she likes to emphasize that her desire had been a product of his illusions. However, ladies should note that only some gentlemen will atone for their offense at this point, while others will stubbornly persist in their attempt for carnal knowledge of her. When in the company of such affronting men the usual rules of propriety and feminine manners must be dropped and a lady should not hesitate to visit on the gentleman a violent change of fortune. For example, a lady should know that the testicles of the gentleman (and it should be noted that once the aforementioned gentleman has proceeded beyond a “stop”, we are using the word “gentleman” with a deliberate sense of irony) house a significant number of sensory nerve endings, and lack the protection of bone, muscle, and fat. Therefore, a lady should know that a squeeze, twist, pull or slap to this area of the body, which the Creator has so conveniently located outside the body, effectively communicates the “STOP” which the gentleman may have had the arrogance or entitlement to ignore. In fact, it seems likely that their location outside of the body is designed to serve just this purpose – the conveniently located reminder – nay, warning – to gentlemen that “STOP” means “STOP”, and that “NO” means “NO”. Therefore, far from needing to worry about importuning this gentleman, a lady demonstrates her reverence for herself when she engages in this vehement, but necessary, rebuff. Upon such action, the gentleman in question will likely drop to his knees; tears are likely to form in his eyes, and his skin may change in color in alarming ways. 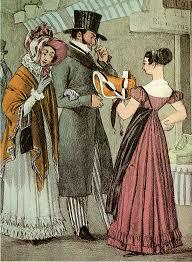 The gentleman may even find himself unable to move for some time without regurgitating the contents of his stomach. A lady need not concern herself with any of these responses, nor should she remain in the situation to observe or assess the situation at hand. A lady has better things to do than to dally with gentlemen of this ilk, and should ring 9-1-1 straight away. By Martha McCaughey and Jill Cermele, inspired the 1853 “The Ladies’ Guide to True Politeness and Perfect Manners, or Miss Leslie’s Behavior Book, An Excerpt” by Eliza Leslie (author of “Mr. and Mrs. Woodbridge”), published in Selections from Eliza Leslie, edited by Etta M. Madden, Lincoln: University of Nebraska Press, 2011.